Get in-depth traffic insights with network traffic analyzer. Identify the top talkers in network along with the total traffic usage. Follow monthly traffic trend to know your bandwidth capacity. Helps to fix problems faster with conversation details. Detect any internal or external security threats in the network. How does network traffic analyzer work? NetFlow Analyzer, the web-based network traffic analyzer, uses flow data such as NetFlow from Cisco devices, sFlow, J-Flow, IP FIX and more and stores them for analyzing and generating traffic reports. In simple terms, NetFlow Analyzer collects flow information, correlates them and presents the traffic statistics in more representable and understandable form. It offers real-time traffic graphs and reports to know about your traffic behavior and usage by applications, users, and their conversations. With NetFlow Analyzer you can monitor bandwidth and traffic in an interface specific level with one minute granularity. The selectable graph allows you to zoom in on the spikes. NetFlow analyzer also shows the data points, which gives the traffic IN and traffic OUT details such as speed, volume, packets and utilization off the total bandwidth. 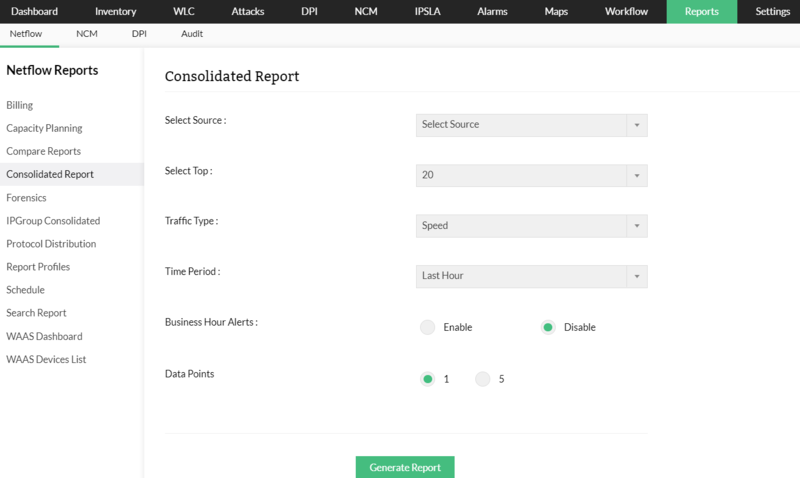 Not only can you view the last hour to last quarter reports, you can also custom select the time period for which you want to view network traffic report. The reports can be exported as CSV or PDF as per your convenience. These reports can be quite useful when you are presenting to the top management. This helps NetFlow Analyzer to be effectively used as network traffic analyzer. NetFlow Analyzer is very simple to deploy and start working with. You can install NetFlow Analyzer on a Windows or Linux machine, and use just a web browser to access the client interface. After installing, export NetFlow data in case of Cisco routers/switches or any other supported flows to set up NetFlow Analyzer. Within minutes, traffic graphs are plotted and reports are automatically generated by NetFlow Analyzer. Identify the top talkers in network from the dashboard. As soon as NetFlow data is received, graphs are generated showing details on incoming and outgoing traffic on the link for the last 10 minutes. From dashboard you can identify which interface, applications, users, ports and protocols are consuming your maximum bandwidth. NetFlow Analyzer Dashboard allows you to customize your widgets and add them to get a glance of top information that you want to focus in your network. Generate real-time traffic reports and follow the traffic trend monthly. You can start analyzing your traffic data with most intuitive bandwidth reports in Network Traffic Analyzer. Consolidated reports show you overall traffic statistics for each WAN link. You can view current traffic patterns, along with details on hosts, applications, and conversations generating traffic. Also, with reporting you can analyze traffic trends to identify peak usage hours, link utilization metrics, and more. You can also view trends of application usage, protocol usage, and more. Incoming and outgoing traffic is analyzed to find out the top applications generating traffic on the network. From here you can drill down to see the top hosts and conversations for each application that is listed. Before categorizing it as an attack there could be some unusual behaviour in your network. 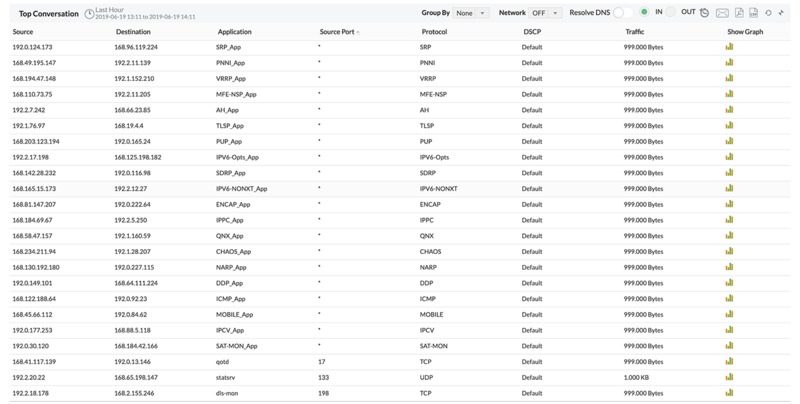 Analyze your network with security reports to follow the unusual behavior and categorize them as either malformed TCP packets or invalid TOS flows or invalid Src-Dest flows or others. Download 30-day free trial of NetFlow Analyzer! Blog: Network Traffic Analysis - Flow based or packet capture? Blog: Security analytics in NetFlow Analyzer. Blog: How Network Traffic Analyzer helps in social sites monitoring? Help Guide: Traffic statistics by application, interface, QoS etc. NetFlow Analyzer provides centralized traffic analysis for our customer's networks with more than 100 interfaces spread geographically. It enables easy troubleshooting of traffic bottlenecks and helps us in capacity planning. The information provided is user-friendly and enables us to take informed business decisions.